Cryptocoryne pygmaea, dwarf crypt, comes from the Philippines. Other than its botancial and vernacular names suggest it doesn't stay especially small. On the islands Palawan, Busuanga and in western Mindanao this crypt populates rivers and rivulets, often with hard water, emersed as well as submersed, also in deeper water. For a long time it was only known from herbarium records. Most authors synonymised it with C. auriculata, which originates from Borneo (Sarawak). Only in about 1970 the first live specimens became known in Europe. In Kopenhagen, Niels Jacobsen found them in a shipment of C. aponogetifolia originating from the Philippines, and later identified them as C. pygmaea. In 1999, Jan Bastmeijer and Herson Morco found many natural habitats of this species in the north of Palawan. 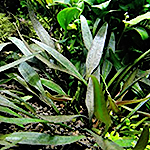 C. pygmaea has proven to be an excellent aquarium plant that is quite easy in cultivation. Despite that, this crypt is not very well-known in the hobby yet. You will get one plant (grown emersed).